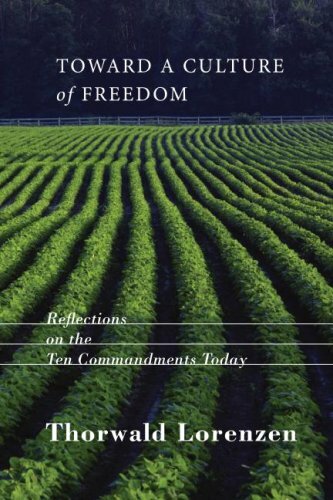 Thorwald Lorenzen, Toward a Culture of Freedom: Reflections on the Ten Commandments Today (Eugene: Cascade, 2008), viii + 253 pages. ISBN: 978 1 55635 296 6. Review copy courtesy of Wipf and Stock. Some years ago I took a fascinating (for many reasons) course on resurrection. One of the principle teachers was Thorwald Lorenzen, who was at that time a Baptist pastor serving in Canberra but now serves as Professor of Theology at Charles Sturt University. Dr Lorenzen is an erudite and [com]passionate NT scholar and theologian who brings to the task of doing theology a wide horizon of international experiences which inform his particular concern for human rights, expressed in a deep respect for the United Nations bill on The Universal Declaration of Human Rights. A key text for the resurrection course was Lorenzen’s Resurrection and Discipleship, a book deserving of a wide readership and one which helped to open at least one undergraduates eyes to a plethora of issues about the nature and role of NT narrative, about the value (and over-value) of tradition, and particularly about the relationship between resurrection faith and justice. For those looking to rethink some implications of the Decalogue in a contemporary and increasingly politically-aware context, for those looking for helpful ideas for pulpit ministry, or for those looking for a book to work through in small study groups, Towards and Culture of Freedom might be a good place to consider stopping awhile. Not all will agree will every conclusion Lorenzen reaches, or even with the way he gets there; but to my mind, that’s one more reason why reading the book is worthwhile.